This is NOT the new center. I’ll get pics of it this week. Update 11/27/12: I spoke with the Facility Manager yesterday. I have revised the posting to reflect our conversation. 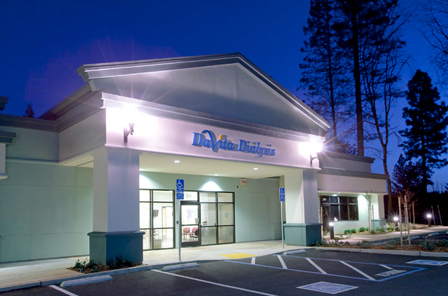 Exactly a week ago, last Monday 11/19/12, Davita opened a new clinic and that was the first day. Opening Day Disaster? Absolutely. But it wasn’t just the fact that the water system broke down, it was almost every aspect of the center Opening Day operation that made it such a debacle. I would expect some things to go wrong on an Opening Day but, this epic fail required more than just the expected. It took some effort to make this a catastrophe. As I said, the water system failed. A dialysis center is a complex system and the water system is a integral part of the facility. The center can’t operate without pure, clean water. However, it’s not like they just turned the water on that Opening Day. They had been operating for over a month with the system. It’s been tested and retested and certified by the federal and state inspectors. (Here’s an example of a water system a similar dialysis center. This is NOT the system installed at the new center!) From that example, you can see it’s not something you just plug in like a vacuum cleaner. It has to be designed, installed, tested and certified and the staff have to be certified to operate it. Something went wrong on Opening Day and, of course, we were offered no explanation. We’re just patients, right? So when I arrived for second shift. I was informed by the person at the front desk, hiding behind the sliding class window, that the waiting room filling with people was because the center was operating two hours behind. The water failure happened before the first shift came in starting at 5:30 am. This was 10:45 am; five hours later. Somehow, the manager couldn’t anticipate that, because the first shift started two hours late, the second and third shifts would also be two hours late. (He says he instructed the receptionist to use that extra five hours to call the patients and let them know they were two hours behind). We could have spent that time doing something other than occupying a waiting room. Instead they waited until we arrived to let us know and, even then, they lied. The person at the desk told us it would be “about an hour wait” and not the two hours they knew it to be. Welcome to the new center! We got to know the waiting room intimately. But here’s the irony. At the door to the treatment area is a sign with the Davita “promise”. The first item is “service”. (I’ll post a picture of it later.) So, now every time I go into the treatment area, I’m reminded that Davita can’t even get the first item on their priority list correct! It a constant reminder that I’m about to enter a center that really doesn’t give a flip about patient-centered care. Davita can write a $50 Million dollar check for Medicare fraud, uh, “mistakes” but they can’t design and organize a center with the patient in mind. It’s taken me a week to get my anger under control and make a reasonable assessment of the new center. Almost everything about it is wrong. On the surface, it’s attractive. It’s got a nice entrance with a huge DAVITA sign on the outside wall. The landscaping is nice. But it ends there. Once you pass through the set of double, double doors to the waiting area, you realize it wasn’t designed for patients. Did they think about the fact that many people entering the center would be in wheelchairs or behind walkers?! As designed, you have to press the button to open the first set of doors, then wait for them to open. After you pass those doors, there’s immediately a second set of doors to also be opened. That’s just the first obstacle. If it was planned to be a buffer to hot or cold outside temperatures, it’s a abysmal failure. It’s best purpose is to obstruct the flow of wheelchairs and walkers. The waiting room has flanks of chairs creating a obstructive wall you must pass by before you can get to a chair to sit down or, if you’re in a wheelchair, you have to block an aisle because they didn’t allow enough space for wheelchairs in the waiting room. Great design guys! The flat-screen TV in the waiting area was a nice touch but it’s mounted on a wall facing the backs of most of the chairs! Most of the people can’t see it! It wouldn’t matter much but when you have two hours to sit there with a TV squawking behind you, it becomes a real nuisance. It was a constant, two hour reminder that whoever did the layout, didn’t think about someone being seated there for two hours. One thing, you don’t want to do is piss off dialysis patients on a Monday morning. We’re full with two days of fluid. We’re in extreme discomfort. We can’t breathe. We can’t get comfortable in any position. Sitting for two hours in a waiting room chair is not going to make it any better! And, there is a whole shift of patients in that same predicament in the same waiting room, sharing their anger and discomfort, and they’ve been lied to about how long they must endure. Bad game plan. In conversation with the manager I discovered that he was really not involved with the design and layout of the new location. Davita didn’t involve him at all in anything except some small details after the fact. The place was already built when we got he involved. He also noted that whoever did the design probably had no dialysis experience. As an example, he pointed out that the drawers located in the treatment area are too small to hold saline bags. In fact, there are no storage areas large enough on the floor at all. The designers were pursuing the “look” rather than practicality. I agree. It “looks” really attractive but if it doesn’t function, it’s not worth it. He agreed with me about the entrance doors and the layout of the waiting room. Again, he wasn’t consulted in those matters and the doors were already there when the building was constructed. Part of the problem was that this was a holiday week, Thanksgiving, so the nephrologist, his office manager, and staff were not around. They are the types who would have attended to these problems if they’d been there. So, we had to rely on the good faith of the nameless “facility manager” from Davita. Another aspect of poor planning. The manager should have been available for at least the first several days. In the Navy, it’s called a “shake-down” — a period when you expect things to go wrong and you are “on deck” to resolve the problems as they come up. This topic will continue. There are many, many aspects of the new center to be covered. I appreciate that Davita has provided me with what I expect to be several days of blogging as I detail the failure of this center. I fully expect that they’ve been doing this for a while. It usually take years of practice and many failures to build this sort of poor performance. Watch for more… the chairs, the TV’s, the “new rules”, the lack of organization, the poor layout, the stressed-out staff and the frustrated patients. I’d like to believe that Davita can learn from it’s mistakes and avoid repeating this in the future. This entry was posted in customer service, dialysis, dialysis equipment, disability, patient care, Patient-Centered Care and tagged dialysis, ESRD, hemodialysis, kidney, patient, patient care, patient-centered care, Texas, treatment. Bookmark the permalink. Wow this post is unbelievable, you sound like you should open your own personal dialysis center. Complaining about everything in sight, you sound like a cranky old man that hates everyone and everything. Perhaps you should quiet down and enjoy your life saving treatment instead of criticizing everything and everyone in sight, like I previously said if you’re so unhappy why don’t you invest a few million dollars and open your own perfect dialysis center, though I’m sure even then you’d find a whole bunch of things wrong with it. Honestly some people’s attitude is unreal, do you even pay for your dialysis treatment? or do you get it for free? and what the hell is this?! “One thing, you don’t want to do is piss off dialysis patients on a Monday morning.” LOL what are you going to do ? write a nasty post it note or blog about it ? ?